Second episode is based on the 23rd/24th volume of the manga. Features Kogarasumaru vs. Sleeping Forest inside Inorganic Net. I watched the Air Gear anime years ago, but then later learned of a manga, so I read all of it and loved it. I'll clear up a few things for the people who haven't read the manga. This OVA is basically a random part of the story, many chapters after the anime ended. The art is really close to the manga art as well, so that's why it's different from the original anime. After watching the OVAs again, I just wish they remade the entire anime, and continued it to the end. Pretty cool to hear and see Kururu in an anime for the first time. ahhhh Air Gear: Break on the Sky.....on one hand, I like the fanservice, strangely, and found the battles to be quite enjoyable....on the other, I despise how poor the story is, how strange the are characters, and how this seemly came out of nowhere. 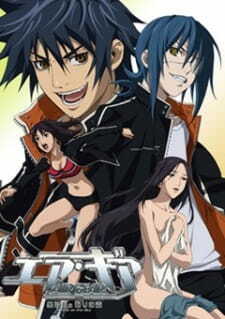 Air Gear: Kuro no Hane to Nemuri no Mori or more awkwardly known as, Break on the Sky, is a collection of 3 OVA's that take place after the storyline of the animated series...I think; it looks like it is supposed to be more in tune with the manga which would explain why it didn't make a lot of sense. Essentially, it is about Ikki and his team, Kogarasumaru, trying to enter a tournament that will help them to reach the top of the trophaeum. Ringo, as a member of Sleeping Forest, is now an enemy of sorts, and the team, for some bizarre reason, has to fight the original Sleep Forest team.....in cyberspace...I am not joking. The story seems like an after thought because they clearly didn't bother to introduce the audience to a slew of new characters that I assume are from the manga. It feels like a vessel for a ton of pandering. Now to talk about something good, the art. The art is actually quite stunning and done infinitely better than the original, which is no surprise seeing we're comparing OVA's, made in 2010, to a series, made in 2006. The detailing of the characters looks great and where it really shines is in the aerial battles, which are undoubtedly the best part of the OVA's. Character's move fluidly, are well detailed, and fly around beautiful backdrops and settings. Music is typical, nothing that stood out really. It does fit into the whole "Air Gear feel" though which is nice. One thing I do have to mention is the laughably bad moments where the voice actors say a line like "All for one and one for all." in English; they clearly haven't had a lot of experience with English. It was strange for the producers to release an OVA that requires a fair knowledge of the manga. I've never read the manga, but I've seen all of the anime series; you would think that would be enough, right? The characters don't act like you would expect from the anime series because of this. Ringo is a lot more outgoing and Ikki is one giant douche....well more so than in the series. On a visual level, it is awesome and I'd definitely recommend it for that. I would say it's for the type of person that say, watches Highschool of the Dead for the reason it was made. If your looking for something deep and meaningful, avert your eyes. I personally think, that the art wasn't that good... I expected much more from the anime that took my hear away *crying* but it didn't meet my expectations. Story: Okay, the story wasn't bad... i mean, it just follows 2 battles out of the manga and so for many neutrall viewers it may seem like some "Amazing Fight"
it's gonna be fun to talk about the ova's for one of my favorite manga. The kuro hane ova's are like a small glimpse of what the air gear anime would have been like it or got the second season it deserves. It's an underrated manga series and could use some more fans. These 3 ova's sum up everything there is to love about the series. The first episode adapts the chapters concerning the fight between Ikki and Ringo while the two proceeding ones adapts the inorganic net arc. A strong sense of tension and action is ever present and the fights are quite exhilarating. Viewers who have not read the manga may be confused by the plot I enjoyed it even more when I didn't know what happened next. I watched this anime before marathoning the manga so all those cool scenarios and drama just sparked my creative juices. Character designer Horiuchi Osamu did a great job bringing the manga’s incredible artwork to life. Character designs are expressive and nicely detailed. This ova also shares the same director as fairy tail and say what you will about the series, shinji ishihara knows how to direct fight scenes. You’ll never see this much violence done with rollarblades anywhere else. Animation felt very crisp and was always a pleasure to look at. In terms of enjoyment, I would have to say these episodes were perfect. Each features a well-animated battle that gets the heart pumping. It was great seeing some of the best moments from the manga come to life. Depending on how much you know of the series, the story can be enjoyed without reading all of the manga. The voice work was spot on and was even superior to the original dub for them tv anime. The best part is that the end of each ova features a kickass song the band " A flood of circle ." If you're a fan of air gear, you must watch this. How to watch Air Gear OVAs?